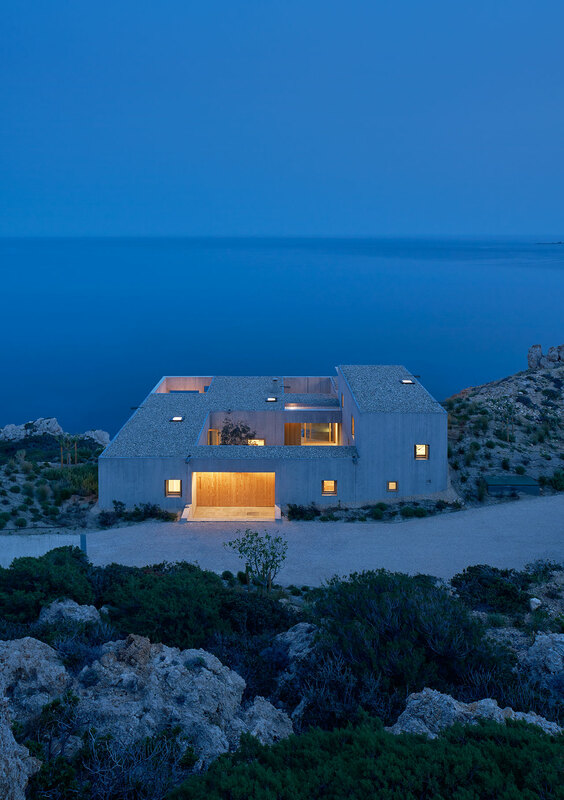 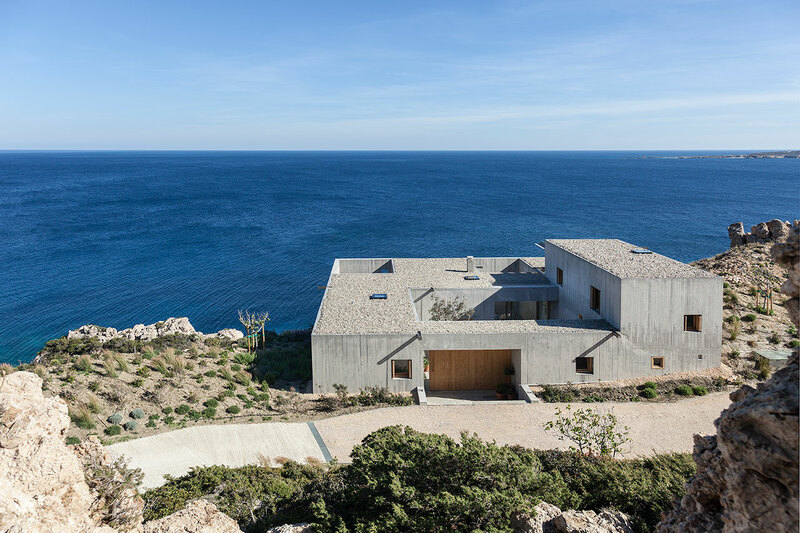 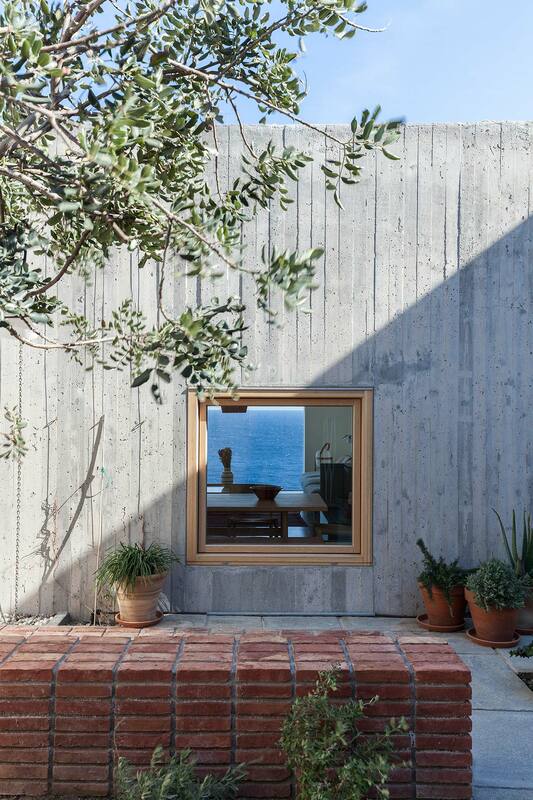 Discretely perched on a jagged hillside that dramatically plunges into the sea on the southeast coast of Karpathos island in Greece, ‘Patio House’ is a stunning summer house by Stockholm-based OOAK architects built as a sanctuary for a Paris-based, French-Swedish windsurfing couple. 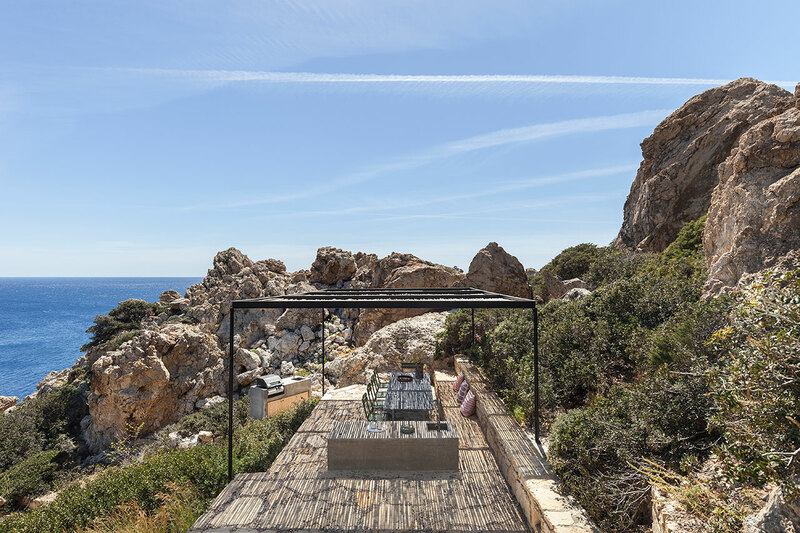 Blessed with expansive views of the Aegean Sea and a stone's throw away from the sandy beach of Afiarti teeming in the summer with windsurfers, it is no wonder they fell in love with the location the moment they set foot on it. 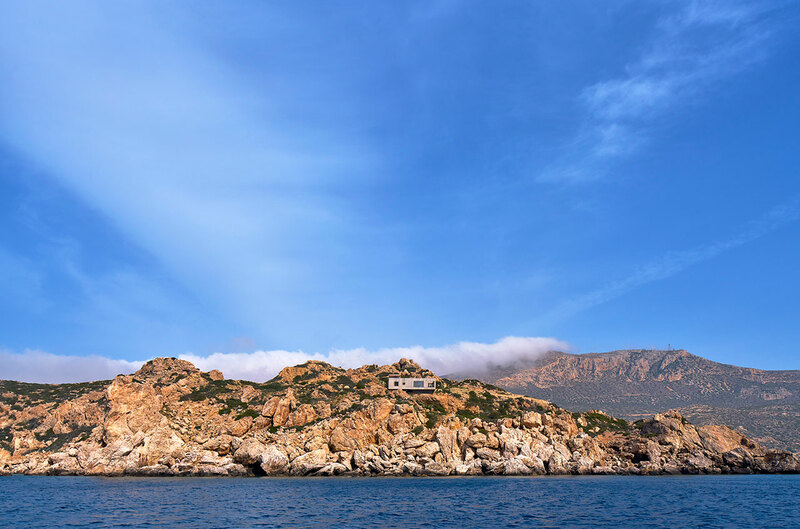 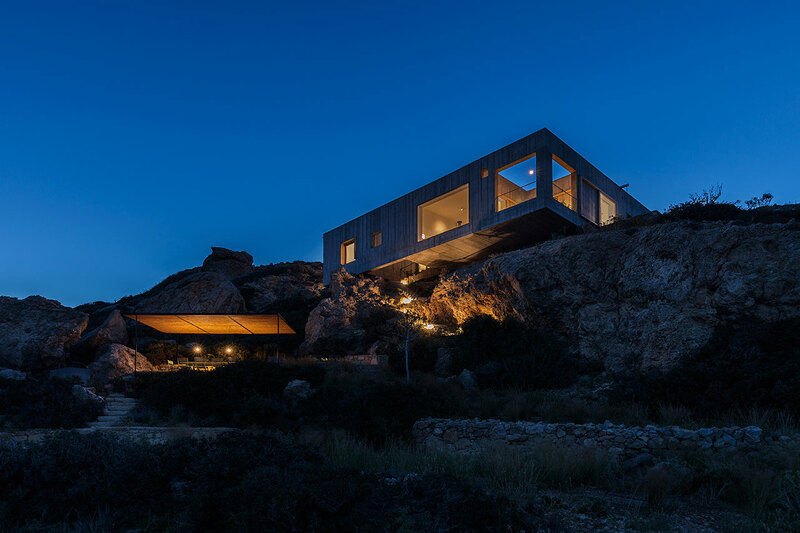 The house seems to have been gently placed on the dramatic landscape rather than having been built on it, a purposeful gesture by the architects who conceived the building as a pristine geometric object in juxtaposition to the untamed ruggedness of the rocky outcrop that it sits on. 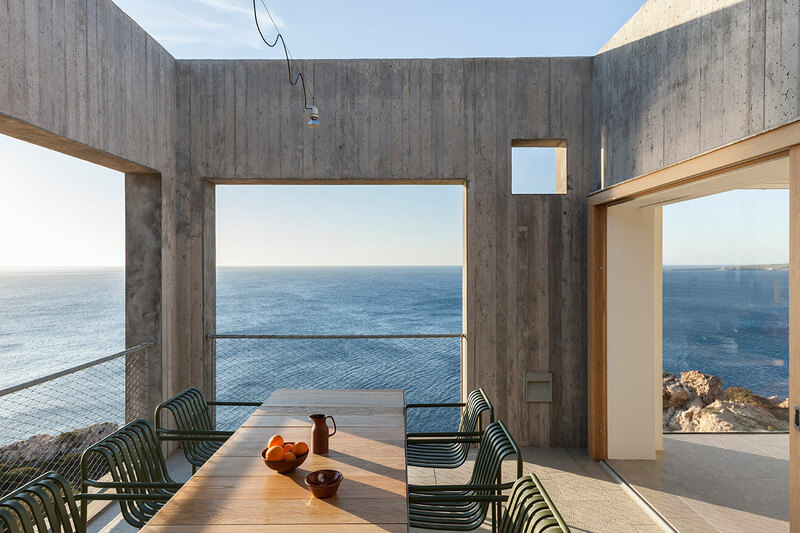 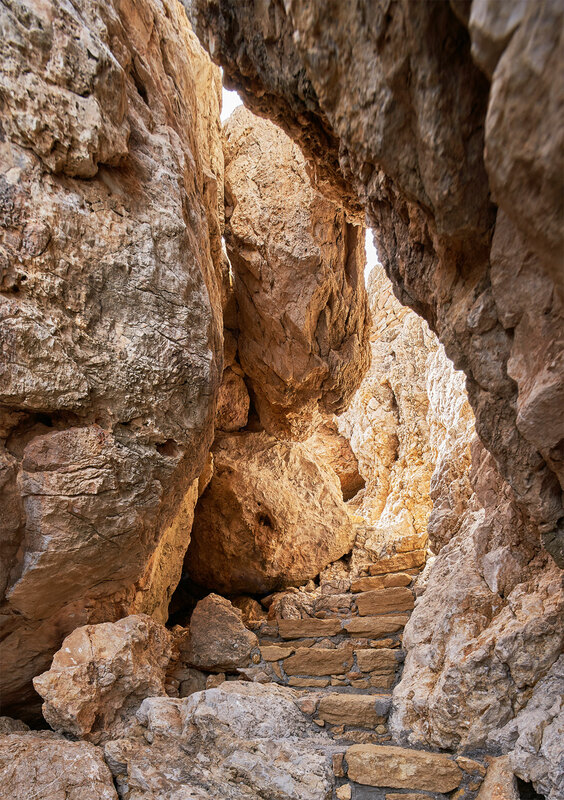 It's a poetic symbiosis of the man-made and the natural that leaves the natural landscape as untouched as possible, serving as a paradigm of contemporary living in places still unspoiled by urbanization and commercialization. 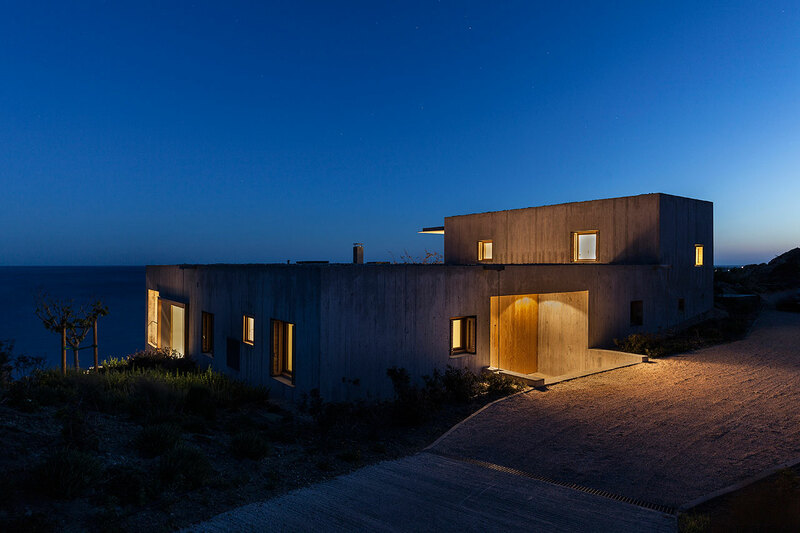 Photo by Åke Eson Lindman. 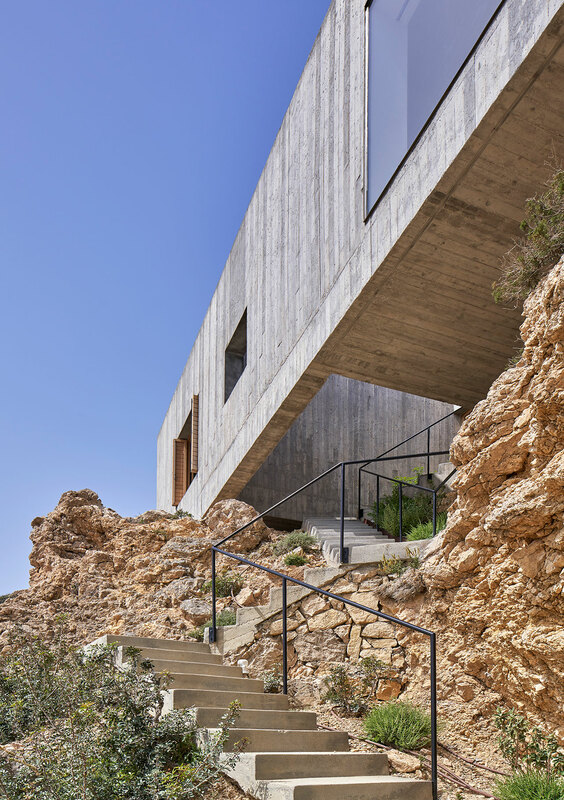 Taking advantage of the site’s morphology, the building rests on a natural plateau while an outdoor dining area occupies a smaller elevation lower down the hillside. 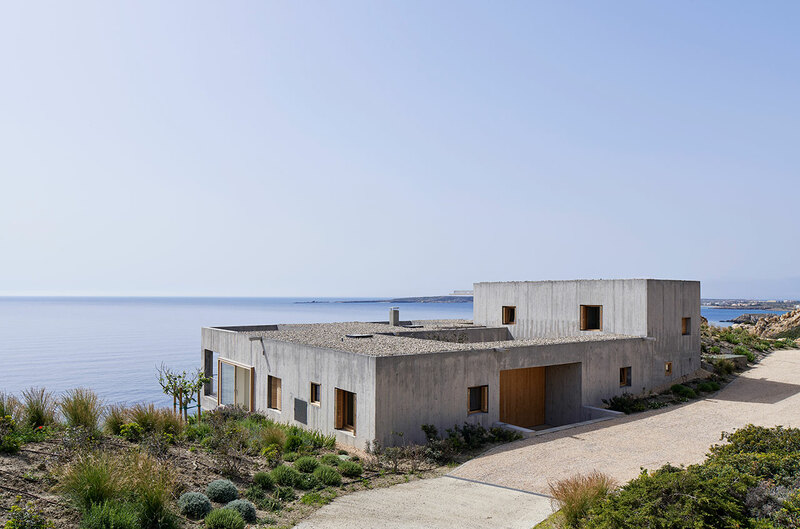 Designed as an austere cubic volume, the structure is cantilevered, extending beyond the plateau which gives the impression, when you’re inside the house, that you’re hovering above the sea. 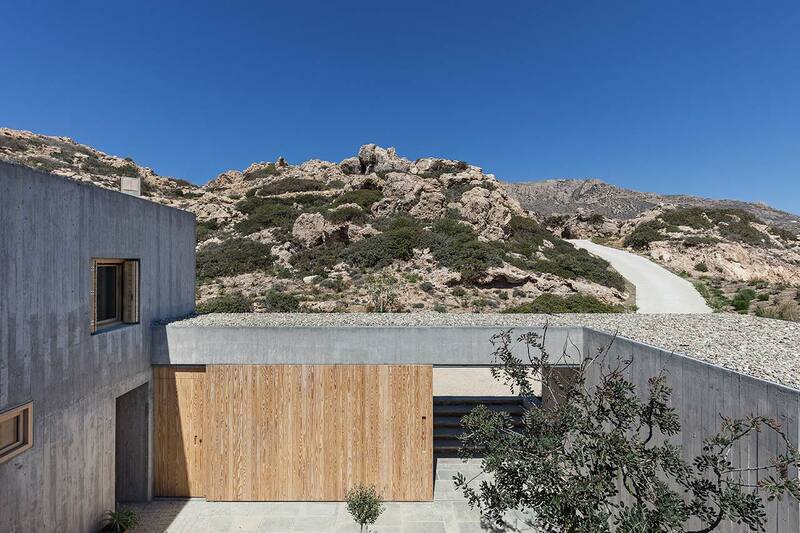 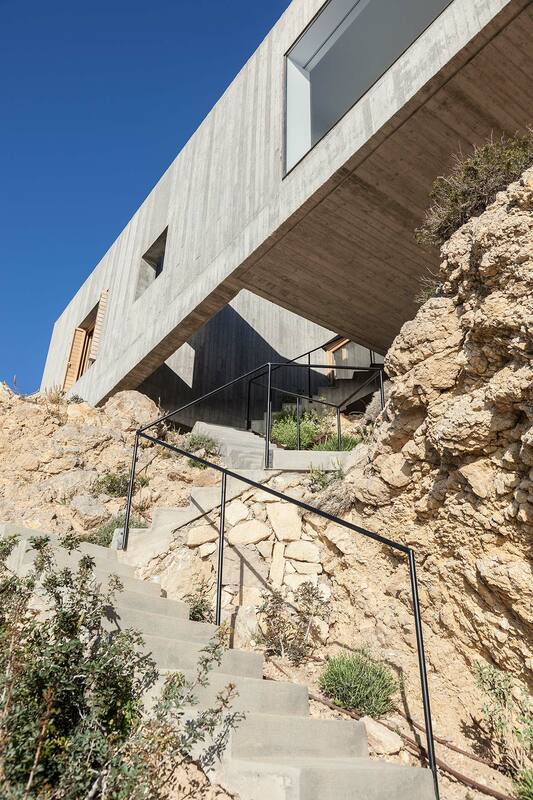 It is also a subtle way to further accentuate the contrast between the building’s rectilinear concrete mass and the wild formations of the rocky hillside. 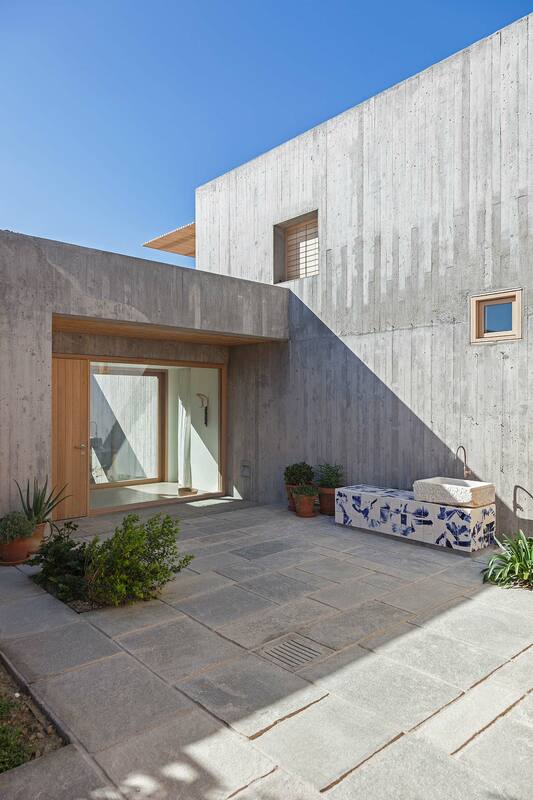 At the building’s core, a large planted courtyard provides a sheltered outdoor space protected from the strong winds that blow in the area, and blurs the boundaries between interior and exterior as do several voids, one of which connects the house with the large outdoor terrace on the site’s lower plateau. 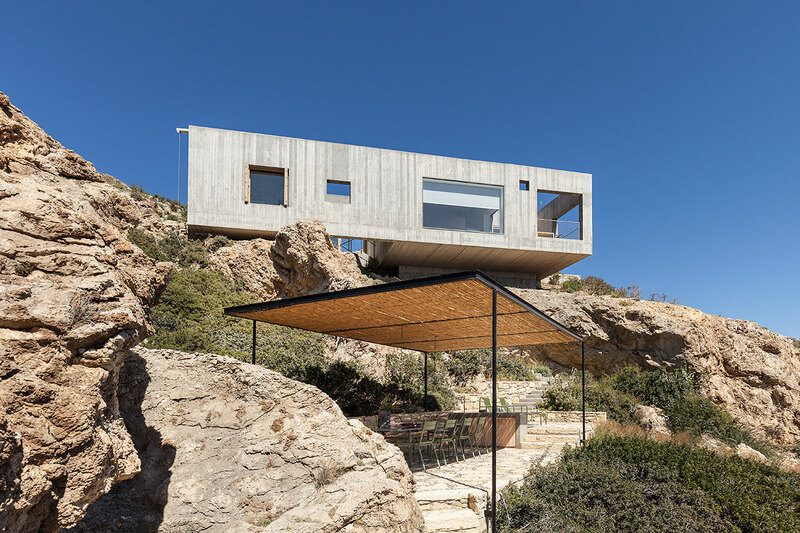 In order to accommodate height differences on the site, a segment of the single-storey-volume is extruded creating an independent wing for guests which also enjoys its own private balcony with panoramic views. 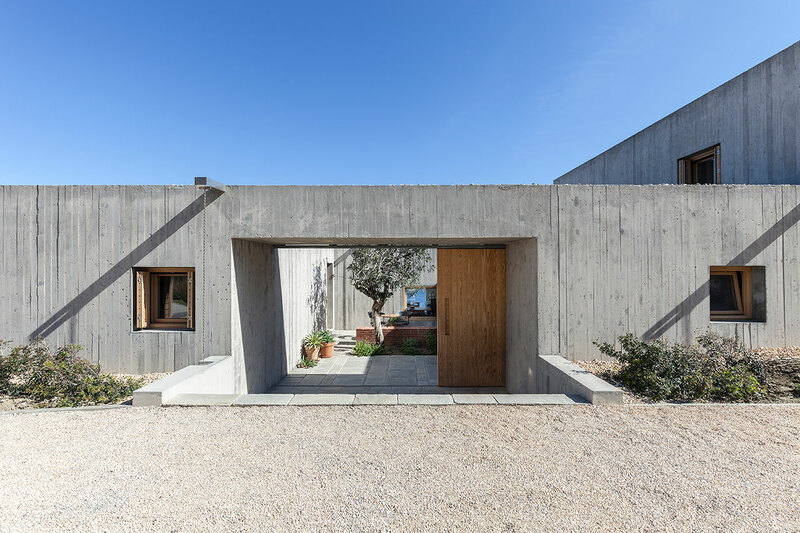 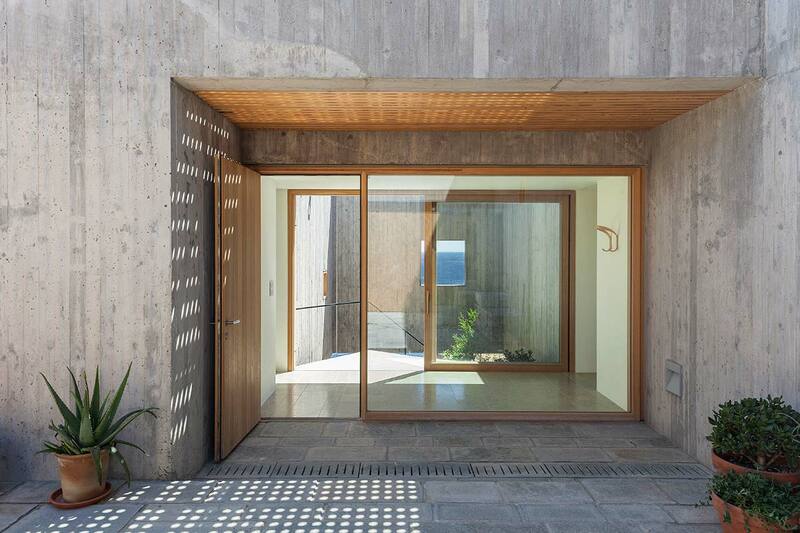 The exposed board-formed concrete exterior is punctuated by a series of differently sized windows and skylights that have been strategically designed to frame unique views and introduce daylight throughout the interiors, while the resulting geometric composition further enhances the building’s object-like appearance. 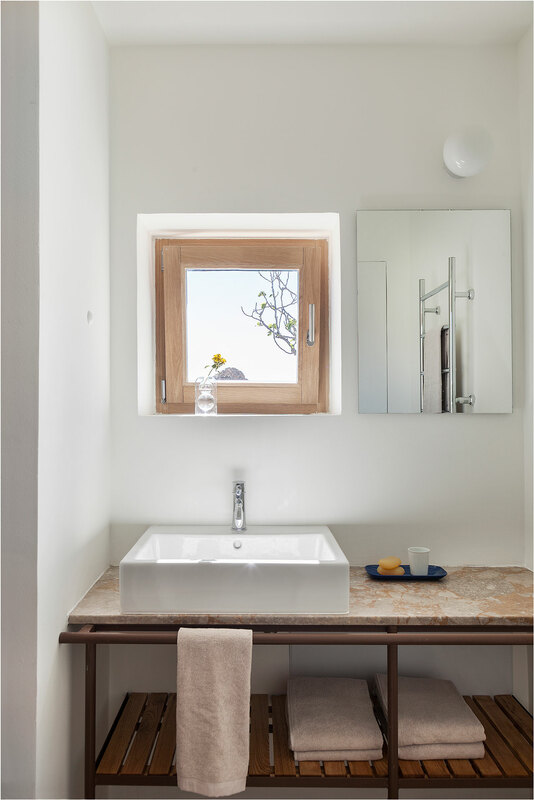 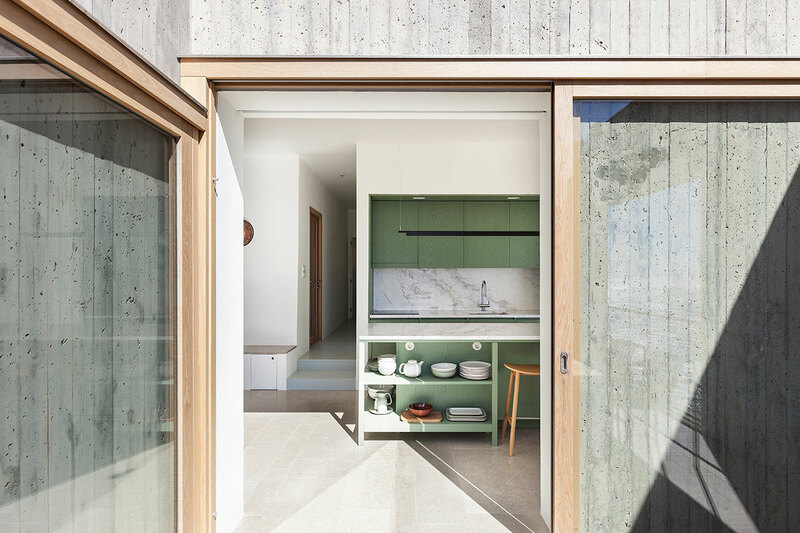 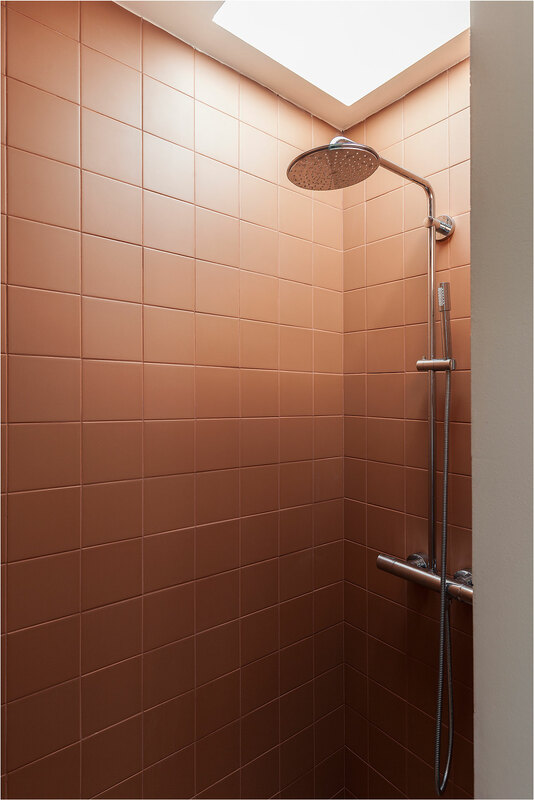 In the interiors, the architects have eschewed concrete for softer surfaces, white plaster and polished stone, which create light-filled spaces accentuated by splashes of colour such as the green timber paneling in the kitchen and the terracotta tiles in the bathroom. 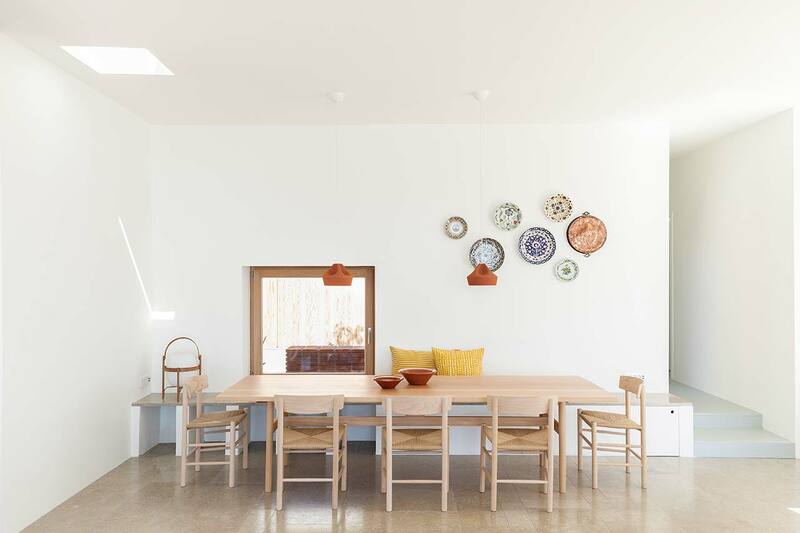 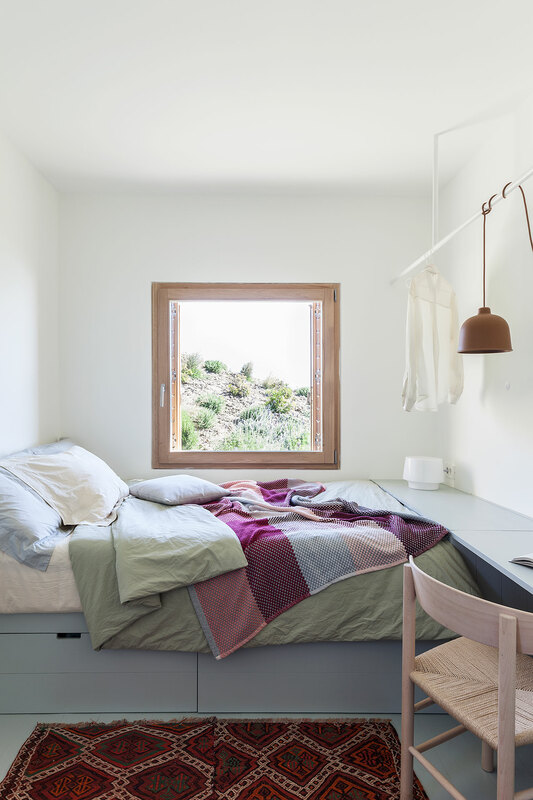 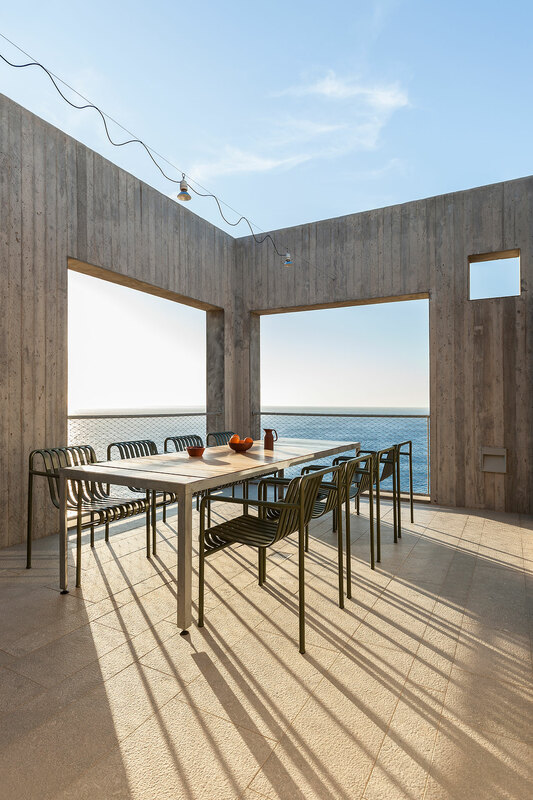 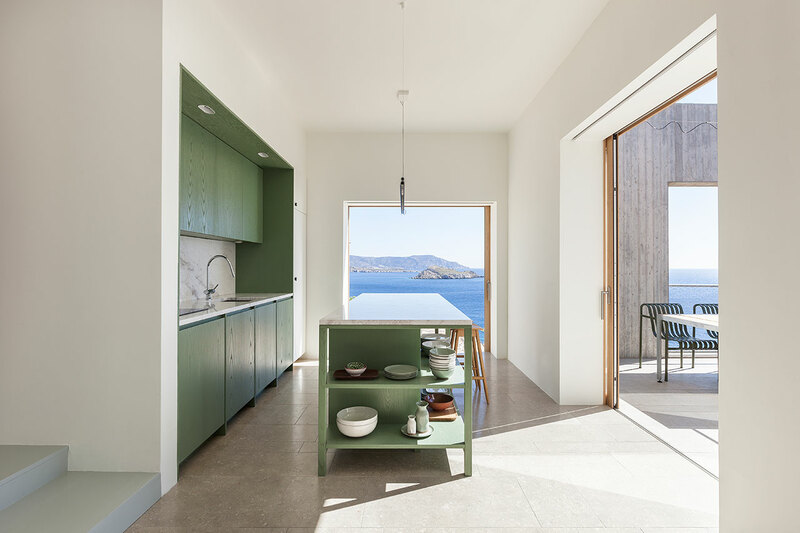 Meanwhile, the combination of Scandinavian furniture with references to traditional Karpathian architecture like the built in stone bench and the colourful ceramics and carpets, filtered through a lens of contemporary minimalism, make Patio House an elegant yet homely sanctuary wherefrom the island’s beautiful wildness can be relished.